I stayed at The Old Brewhouse as a guest of ScotRail. 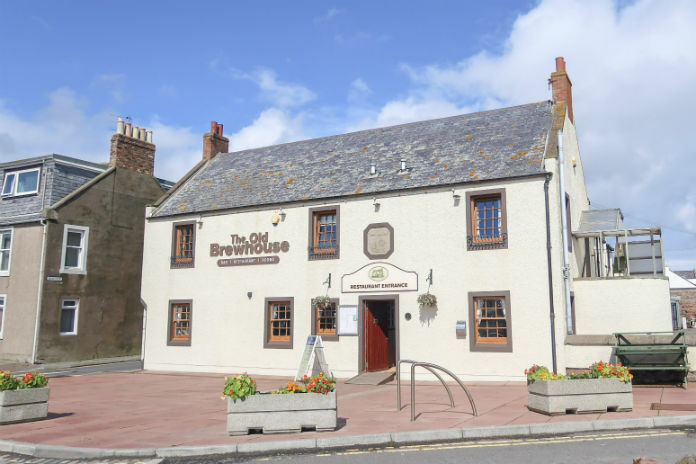 The Old Brewhouse* is a family run hotel, restaurant and bar, which sits on the waterfront in Arbroath, Scotland. The building dates back to the 1600s, and looks out towards the Bell Rock lighthouse and the North Sea. If you’re lucky, you may spot dolphins and seals, and you’ll certainly be able to watch the fishing boats as they come and go. Arbroath itself is a small town in the Angus region of Scotland, around 16 miles from Dundee. It’s easily accessible by road, or you could take the train – the journey from Dundee only takes around 20 minutes. I visited the town as part of my ‘Spirit of Scotland’ tour with Scotrail so I arrived by train. The Old Brewhouse is about a 10 minute walk from Arbroath station. But with the cold rain falling almost horizontally, it felt a lot longer. I hung onto the hood of my coat with one hand, and pulled my suitcase along behind me with the other. The whole time, I was cursing my decision not to call for a taxi! But soon, I could smell the unmistakeable scent of the sea, and I knew that I must be approaching my destination. I walked into the Old Brewhouse to a warm welcome. My soaking coat and suitcase were taken from me, and I was soon sipping a steaming cup of coffee. Normally I would check into my room and then explore the facilities and the area. But I arrived at lunchtime, and my room was not due to be available until 2pm. And as the rain was still falling heavily, I decided to do things in reverse. The Old Brewhouse* prides itself on serving home made food, and really focuses on good quality local produce. You can expect to see Aberdeen Angus steaks, freshly caught haddock and of course the local speciality – Arbroath smokie. Still feeling the chill of the rain, I decided to sample their 2-course lunch special. That included soup of the day and a choice of several main courses. For my main course, I had chosen the home-made Lasagne. This was served with garlic bread and a choice of salad or chips. It was packed full of layers of a really meaty ragu, smooth bechamel and the cheesiest topping I think I’ve ever seen on a lasagne! I was too full for pudding after that, unfortunately. But I could have chosen from a range which includes cheesecake, chocolate cake and a traditional home made Clootie Dumpling among others. That evening, I opted to eat fish and chips on the seafront to take advantage of the better weather and sea air. But the Old Brewhouse also serve food in the evening, when you can choose from an expanded version of the lunch menu, including locally caught mussels and venison medallions. There’s also a Viking Platter, which is a sharing platter of mussels, Smokies, prawns and more – definitely one I want to try out when I return to Arbroath! After lunch, my room was ready and I headed up to take a look around. The rooms are accessed through a separate door, which means that you can go up to your room without going through the restaurant. There are six rooms at the Old Brewhouse, including one which is in a self-contained building. Each of them has a nautical name, and each has been decorated individually. I was staying in the Seagate room, which is very bright and spacious, with a peaceful neutral colour scheme. Although this room doesn’t have sea views, the skylight ensures that the room receives plenty of lights and feels very fresh. The king sized bed was covered in high quality crisp white bedlinen, and plenty of plump pillows. Guests at the Old Brewhouse can take advantage of free internet access, but I did find that the signal was a little hit and miss. My room also had a TV and DVD player, ipod docking station, a hostess tray (with some yummy biscuits!) and a comfy seating area. There was also a desk/vanity unit, and plenty of plug sockets so I had no problem charging my phone and laptop. The bright and fresh feel of the Seagate room also carries over into the en-suite bathroom. It’s not a huge room, but it was immaculately clean. There’s a decent sized bath with overhead shower, which I have to admit is not my preferred arrangement. But at least it gives you the option of bath or shower, while working within the size of the room. There were plenty of soft, fluffy towels on a towel heater, and a good selection of complimentary toiletries. The general feel of the Seagate room was one of freshness, it’s very light and airy. The neutral colours, beach-themed decoration and abundant natural light make the room feel very restful. And eventually the rain did stop, which let me go out and explore the town. With views like this just a few metres from the hotel, I really did feel like I’d found a piece of heaven on the East coast of Scotland. I’m not sure if it was the comfy bed, the sumptuous duvet or the effect of the sea air, but I slept incredibly well at the Old Brewhouse. And when I stepped outside to go down to breakfast, this is the sight that greeted me. I love being by the sea, it always improves my mood, and this view was a great way to start my day. The breakfast menu included all of the standard options that you might expect. And it was very tempting to opt for the full Scottish breakfast – I developed a real taste for haggis while I was in Scotland! But you can’t go to Arbroath without trying the local delicacy, the Arbroath Smokie. This is locally caught and smoked haddock, and it’s a traditional speciality of the town. So although I really wanted haggis, I decided to have a Smokie and scrambled egg for my breakfast. And I didn’t regret my choice. The Smokie was as good as I had hoped, very tender, with a good smokey flavour. And the scrambled eggs were possibly the finest I’ve ever eaten. They somehow managed to be both light and creamy at the same time. I was very tempted to ask for the recipe! I really can’t praise the Old Brewhouse highly enough. It combines the service and surroundings of a high quality hotel with the comfort and welcome that you get from a family establishment. My room was beautifully presented, and incredibly comfortable, and the food was delicious. Although I only stayed one night, somehow I felt at home. Arbroath is a lovely town, and I would love to spend more time there. If you get chance to visit, I would definitely recommend staying at the Old Brewhouse. Thank you to the Old Brewhouse in Arbroath for a wonderful stay in their charming wee hotel!